WHANGAREI, APRIL 4th, 2017 – Emerging Northland artist, Jade Morgan's solo show titled High Voltage, opens on Wednesday, April 5th, 2017 at 4.30pm in the Shutter Room Gallery, located in the Old Library, Rust Ave, Whangarei. to electrical energy by default. The High Voltage exhibition is a collection of Digital Art, Glitch Aesthetics and Photography. An error in software, signal or in digital information; a ‘glitch’ is often referred to as a mistake or a slip that paralyses non-contiguous visual information. This slippage momentarily visually exposes the fault. As an aesthetic documentarian, Jade Morgan collects and documents the ‘glitch’ in order to expose the spilt-second unplanned phenomena. Her work captures, pushes and heightens the aesthetic potential of these errors and fragments that materialize, by turning them into actual static matter for us to contemplate. Jade Morgan has a BAA (visual) and studied Digital Media at the Media Design School. She has been a tutor at NorthTec since 2007 teaching on the Diploma of Digital Multimedia Production and Diploma of Applied Arts (Digital Arts) as a senior academic tutor. While still involved with industry her key focus is community driven and she regularly exhibits both in New Zealand and online. Morgan is a digital media artist who works in various mediums across digital media. Her work is a hybrid of digital imaging, photo manipulation, glitch art, video art, motion graphics, web and digital design. 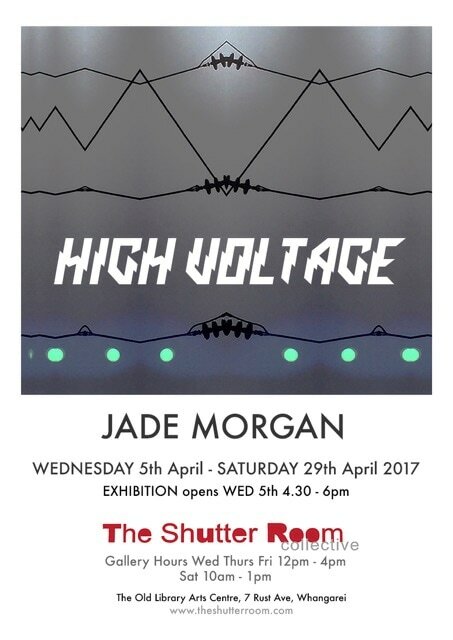 Please join Jade Morgan and the Shutter Room team for the opening of High Voltage on Wednesday, April 5th, from 4.30-6.30pm, everyone welcome. The exhibition runs until Saturday 29th April, 2017. Gallery hours Wed-Fri midday to 4pm, Sat 10am-1pm.